GIFT procedure! Buy 4 Hydrafacial Procedures Optional and 5 procedure will be for FREE. *Hydrafacial lips 15 eur, valid for one of Hydrafacial applications. Hydrafacial TOWER – multifunctional effect on the skin! Hydrafacial is patented, non-invasive skin rejuvenation, deep cleansing and moisturising skin care technology in modern all-inclusive aesthetic cosmetology procedure. Today Hydrafacial is in the list of the most popular procedures performed at prestigious aesthetic medicine clinics and spa centres all over the world. The Progressive Hydrafacial procedure has triple effect when skin cleansing, exfoliation, extraction, antioxidant therapy and moisturising are all carried out within a single procedure! The skin is simultaneously efficiently cleansed, exposed to a vacuum and efficiently moisturised using various active serums. The skin is rejuvenated, deeply cleansed, intensely moisturised, various skin problems are addressed and an anti-ageing procedure is performed. This is an advanced skin care system which nourishes the skin and solves various skin-related problems: it slows down the aging of the skin, reduces not only minor skin lines, wrinkles, but also enlarged skin pores, improves skin texture and tone, helps restore the skin after sun damage and helps resolve various skin problems, such as oily skin that is prone to acne, rosacea and hyper-pigmentation; the effect is instant and long-lasting. 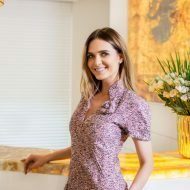 This procedure has satisfied the expectations that aesthetic procedures are efficient and guarantee visible results immediately after the procedure. Hydrafacial procedures will allow you overcome various skin problems and enjoy healthy and radiant skin! Hydrafacial procedures at Era Esthetic laser dermatology clinic are performed with the Hydrafacial Tower device. What is the Hydrafacial spa skin-cleansing procedure? This is a gentle, non-invasive and complex rejuvenation procedure which causes the “WOW” effect! Never before has skin cleansing been so efficient and so comfortable at the same time. Forget about the time when skin cleansing was painful and caused skin redness. Hydrafacial spa procedure will give you pleasant sensation, while the effect is visible instantly! After the procedure, the skin will be clean and moisturized, as well as more radiant and sleeker – the changes will be apparent and will become even more visible with every procedure. A single procedure is enough to show you the efficiency of Hydrafacial procedures. Try it, and see for yourself! Individual programs are made to address various skin problems. If, for example, there are problems with the skin, a four-to-eight procedure course is performed to solve the issue. Before the procedure, the therapeutists, cosmetologists, dermatologists and aesthetic treatment doctors working at our clinic will consult you, choose the most efficient program for you and come up with a plan of procedures. Hydrafacial procedures are very popular all over the world and they have been acknowledged globally by professional cosmetologists. What is more, this method has been given various awards, such as Best of the Best, Platinum Spa Treatment, Best Equipment, etc. An advanced skin cleansing and rejuvenation procedure during which exfoliation, surface skin cleansing and opening of pores are performed; during the extraction, deep skin cleansing is performed; pores are cleansed painlessly, skin tone is equalised, skin is enriched with active antioxidants as well as hyaluronic acid serums with the help of a vacuum. Furthermore, blue or red LED light therapy is performed. Enviable looks just in 45 min! This is the perfect choice for businesswomen and businessmen that prefer saving their time. In only 45 minutes the skin will become radiant, small wrinkles will be evened out, and the skin will become more elastic, healthy and relaxed. You will look like you have just got back from holiday! Be sure to use this opportunity to quickly remove the signs of stress, exhaustion and insufficient sleep, and return a healthy look to your skin. During the procedure, the skin undergoes a process of active cleansing and moisturising; this improves the skin’s microcirculation and tone. During the procedure, active serums supplemented with growth factors are used. This pre-red carpet procedure has become popular among worldwide celebrities who have to look stunning here and now! The procedure offers a perfect skincare solution which enriches the skin with antioxidants and deeply moisturises the skin with hyaluronic acid. During the procedure, the skin is exfoliated and is deeply cleansed; by employing a vacuum, any dirt residue is extracted and removed from the skin, moisturising and nourishing the skin with all essential agents. It is performed 1-2 days prior to a significant event. In order to achieve PERFECT results, a course of procedures is performed if issues persist, but no more than 1-2 procedures per week are required. You will need only one procedure to look stunning before a significant meeting. With the help of this advanced technology procedure, you will be able to prepare for an important meeting or venue in just 15-30 minutes and go to your destination right after the procedure. During the procedure the skin is cleansed, pores are opened, and with the help of a vacuum the content of the pores is extracted and removed; if needed, non-crystal diamond dermabrasion is performed, acid peeling procedure is applied, scarred skin cells are removed, pigmentation caused by acne is reduced, enlarged skin pores are contracted, and antibacterial serums are injected; these serums penetrate the skin, thus efficiently reducing acne breakouts. After the procedure, the blue light therapy is applied – a type of therapy that is known for its anti-inflammatory properties, which help effectively treat acne breakouts. Pigmentation treatment with the help of Hydrafacial is the newest approach to solving pigmentation-related problems safely and efficiently. During the procedure, the skin undergoes complex treatment. Scarred surface layers are removed as these layers contain accumulated cells with differing pigmentation properties; this way pigmentation is eliminated. Simultaneously, as the pores open completely lightening serums, vitamins and other substances are injected into the deeper layers. They nourish, heal and protect the skin. LED red light therapy is then applied. Makeup will look perfect only if the skin is healthy and sufficiently moisturised. Before applying professional make-up, it is necessary to perform a face-moisturising Hydrafacial procedure. It is a pleasant procedure which efficiently cleanses the skin, moisturising and nourishing it at the same time. The procedure makes the skin moisturized and radiant. During deep-skin moisturising, the skin is enriched with hyaluronic acid without injections having to be performed. It is suitable for any skin type, including sensitive and thin skin. Hydrafacial procedure is performed; and if needed, acid peeling is carried out as well; serums with peptides, which stimulate the synthesis of collagen, are injected into the patient, in addition to serums containing antioxidants and hyaluronic acid. LED therapy using blue or red lights is also carried out. The procedure gives energy, embraces the whole essence and luxury of Hydrafacial procedure for the face, neck and lower neckline. At first, lymphatic drainage therapy initiates the detoxification process. Non-crystal diamond dermabrasion is applied to rejuvenate the skin and make it radiant. During the luxury Hydrafacial procedure, the skin is deeply cleansed and exfoliated, extraction and moisturising of the skin are performed. Special anti-aging serums are used to reduce mimic wrinkles, especially in the forehead area and around the eyes, producing a Botox-like effect. This rejuvenation procedure is performed using the peptide complex and growth factors, as well as using antioxidant therapy and moisturising with hyaluronic acid. The procedure is completed with LED red- or blue-light therapy and a collagen mask. 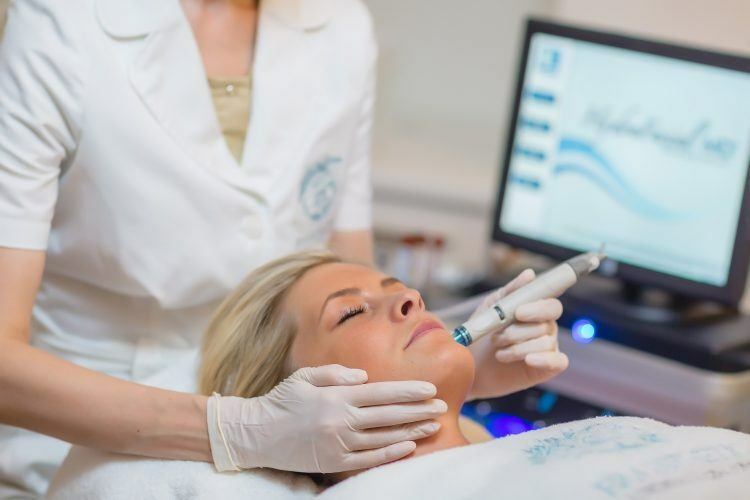 This popular Hydrafacial procedure is a combination of beauty injections, plasma lift, rejuvenation using light diodes, fractional skin rejuvenation Fraxel Dual, non-surgical skin lift, Thermage CPT and other aesthetic and laser dermatology procedures.